This born/raised brother band from Tulsa, Oklahoma consists of 3 young lads who write and perform their own music, the names of these guys are: Isaac (17), Taylor (15), and Zac (12). Ever since their father�s job took them overseas, they have had a knack for oldies. Why? You might ask, well while they were traveling around exotic places like Venezuela, Trinidad, and Equador, they had no music that they could listen to (or at least they could understand), so their parents (Walker and Diana Hanson, also oldies fans) bought them Time-Life tapes from the late 50�s to early 70�s. One of those things you might see on a late night info-mercial. They listened to the tapes and memorized all the songs. Some of the artists of their inspiration were (and still are) : Johnny Taylor, Otis Redding, Chuck Berry, Aretha ("Queen of Soul") Franklin, and yes, the also loved the Jackson Five (my personal favorite). Even before they returned to the states they began to take a real interest in music. They started writing original songs, from everything to ants, to lullabies for their younger siblings (which now, there are 4 (excluding them, of course) 3 younger sisters Jessica (8), Avery (7), and Zoe (not even one yet), also, a younger brother Mackenzie (4)). 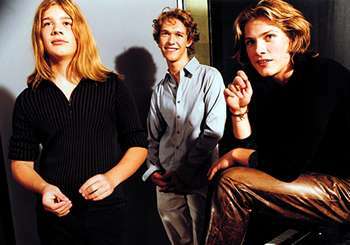 The Hanson Brothers (as they were originally called) started to perform at local festivals and bars (yes, bars, outside actually seemings how they were to young to even get in) getting as much exposure as possible. Up until about 2 or 3 years ago, they sang a capella, and to backing tapes, but then later decided to move on with their incredible musical talents and learn how to play instruments. Isaac took guitar, Taylor took the keyboards, and Zac (as he puts it) was "stuck with the drums". And the rest, as they say, is history. 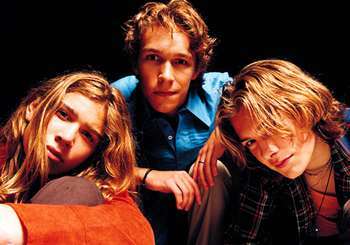 The Hanson Brothers became known as only Hanson, a band that all people, of all ages, all cultures and races love. Their worldwide success of their first single ("Mmmbop") launched them into superstar status, and their other 3 that followed ("Where�s the Love", "I Will Come To You", and their latest one "Weird") took all the thoughts of one-hit-wonders away from critics. Now, a little over a year later, the have sold over 12 million records, have a platinum single (...or 3), and a gold record under their belt (and it doesn�t seem to be weighing them down any!). And have no fear hansonoids, there is plenty left to come!! **written by me, corny eh? ?